Michael (right) and Phil (centre) have both joined us from Wallingford, Sinodun and District Rotary Club that sadly closed at the end of June. Both have been actively involved in Oxford Spires for years: Michael has been a key member of Pooh Sticks and Truck teams for a long time, and we have supported Phil’s projects in Uganda for a few years. Michael has joined us as a full member and Phil has joined as an honorary member. 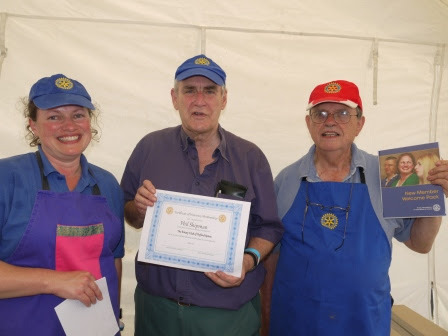 They are both seen here with Club President, Karen, at Truck in July.